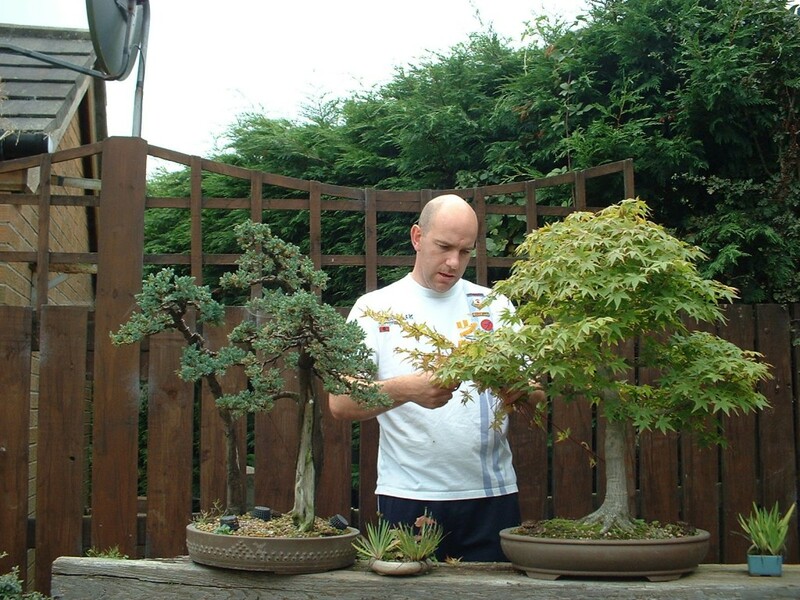 Ian joined the society back in 1993 after receiving a bonsai as a get well soon present from his sister. He was hooked, and spent every possible free minute for the next two years playing with wee trees. He has remained heavily involved with the club over the years as a committee member, and holding the position of Secretary and Chairman on several occasions. He is our current Chairman. 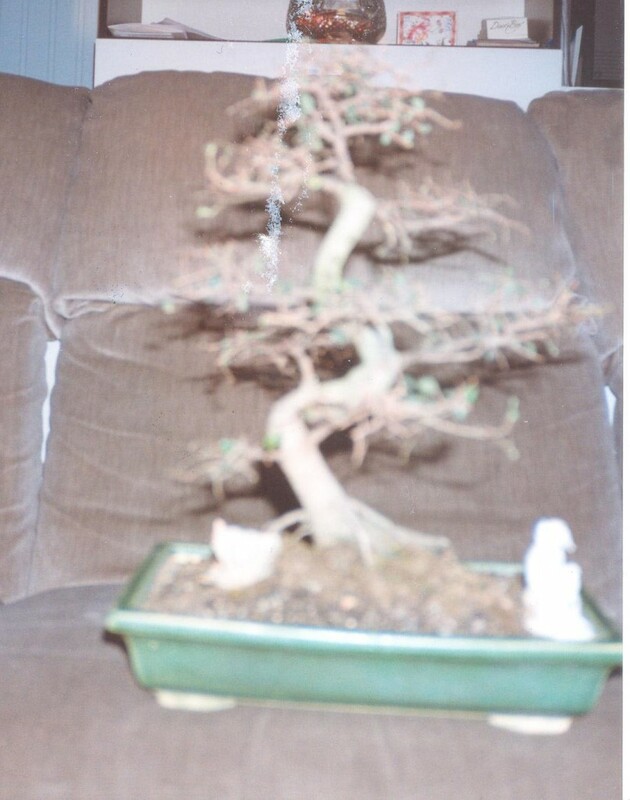 This is the first tree he ever bought, the usual Chinese Elm. First tree way back in 1993. Sorry for the photo quality! Below is a photo of his collection back in 1995. Nearly everything you see was started from nursery stock, by far the best way to develope skills and learn techniques. A few years later a few more trees were added. Still a lot of trees started from nursery stock and collected from gardens. What can be noticed is that the size of the trees is generally getting bigger! 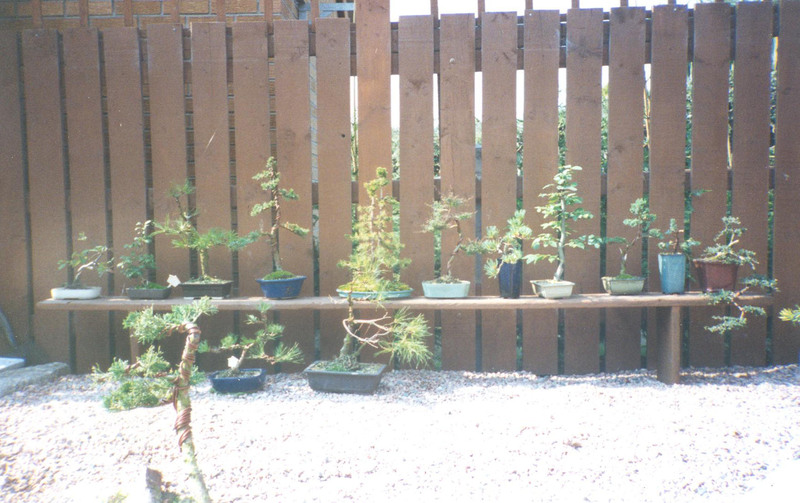 The photograph below taken in 2000 shows how Ian had moved on to a mixture of bought trees and home grown ones. As you learn the techniques and foibles of each variety from garden centre stock you build up the confidence to work with better quality trees. Over the years the collection grew larger and more space was required and a training/work area was created at the rear of the garden. This included a polytunnel to help with over wintering his trees and to aid in the survival of collected/yamadori material. More collected material including his Escallonia which can be seen on the case studies tab. 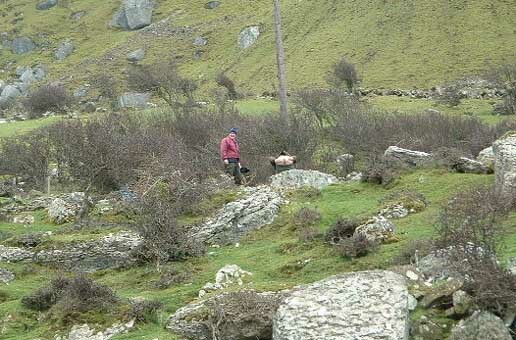 To improve his collect Ian was keen to go on collecting trips with other Society members. 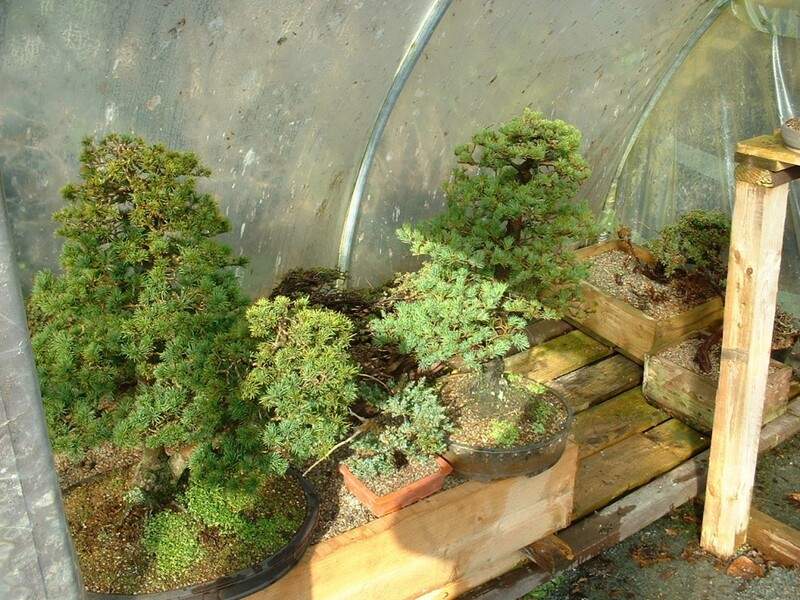 One of the best days out you can have in bonsai is a collecting trip with good friends. Collecting Common Juniper. Ian still has that tree which saved his life! Hawthorn collecting, is that flash of white a rabbit's tail as it runs away? Aiming to improve his ability, Ian, along with other members of the Society, took the opportunity to participate in workshops with Robert Porch who visited Northern Ireland over many years passing on knowledge to the club members. 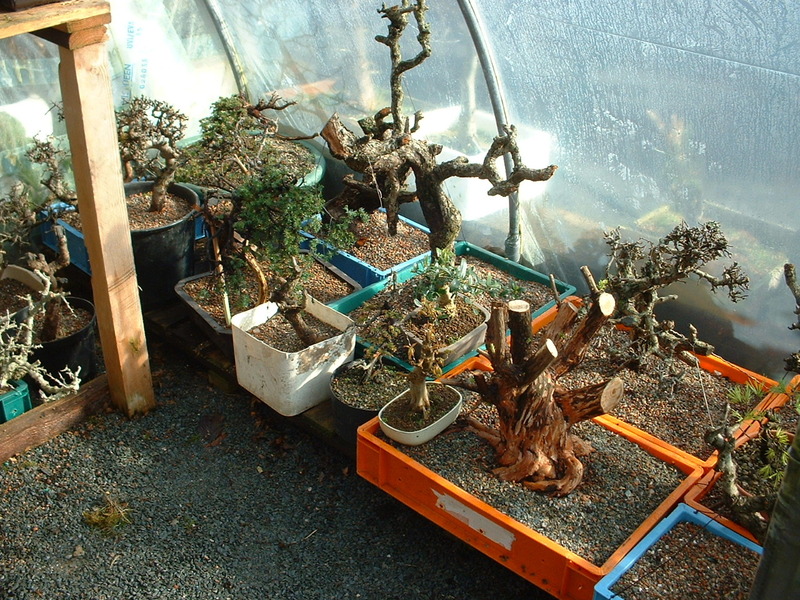 Later on Society members visited Willowbog Bonsai to participate in workshops with Marco Invernissi. These were such a success, Marco even came over to Northern Ireland for a series of workshops the following year. 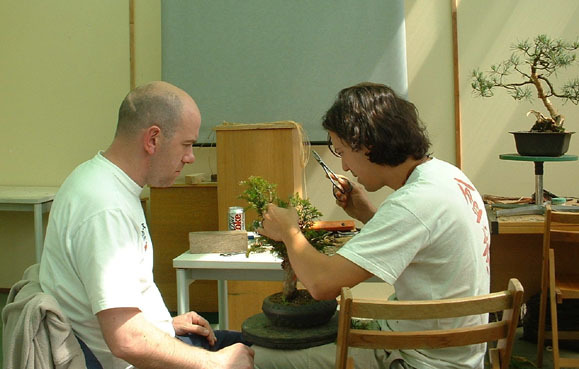 Ian in a workshop with Marco at Willowbog Bonsai in 2003. Taken at a Robert Porch workshop. The nutter with the chainsaw is Peter Snart of Willowbog Bonsai. 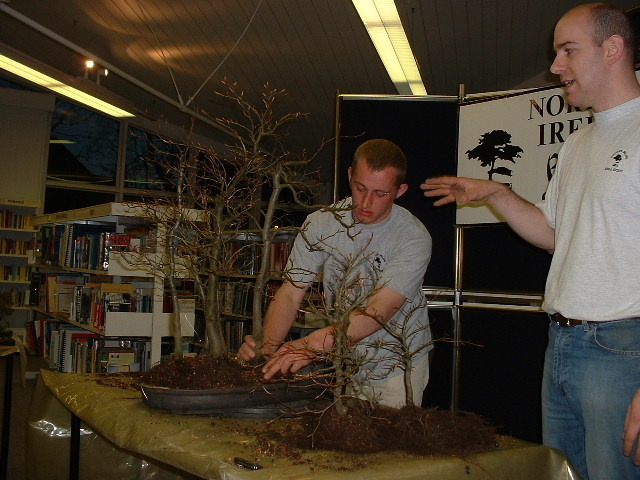 In 1994 Ian gave his first talk on bonsai at a club meeting and has been talking ever since. Some would say he talks to much, I think he would generally agree. Ian and Philip demonstrating how to create a Beech Group 2002. Group still owned by Philip's Dad Frankie, another club member. In 2006 the BBC where filming a series in Northern Ireland called Secret Gardens and asked if a member of the NI Bonsai Society would be willing to give it a go. Knowing Ian’s love of talking, he was volunteered for the job. Below is the video clip of his garden. You can see what we mean about talking for yourself! Ian would like to point out that being referred too as a ‘master’ wasn’t his idea and was dubbed on at a later date. 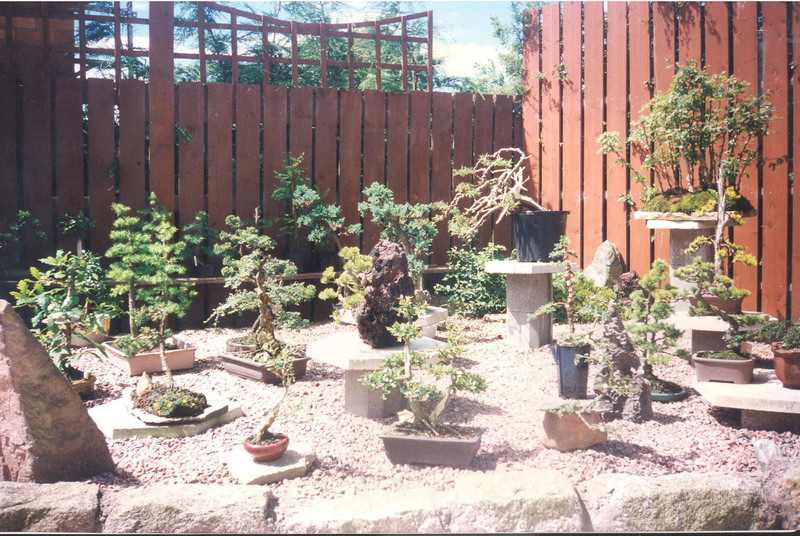 This series has been repeated in Northern Ireland about 15 times in the last 4 years and has helped promote bonsai in the N.I. 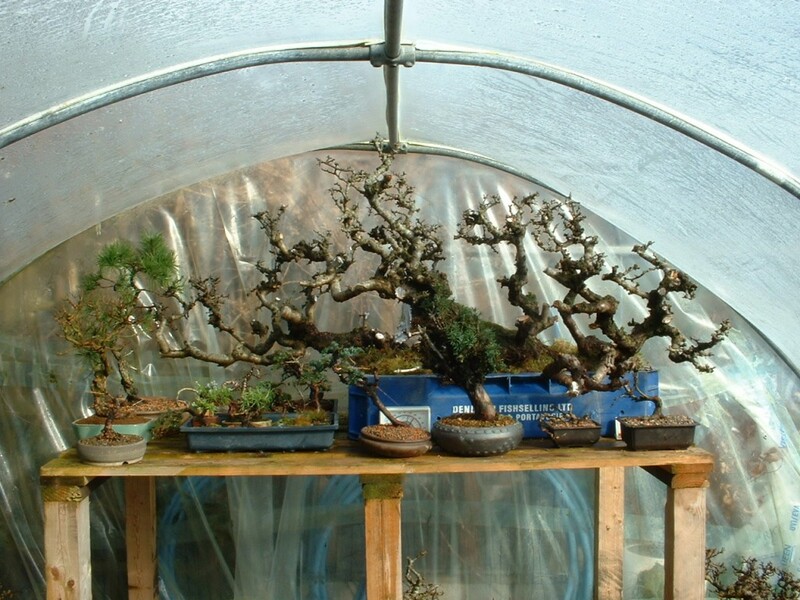 Ian’s outlook on bonsai as a hobby is simple. ” I create bonsai to make me happy. I get an even greater buzz from helping others learn. Ian hopes that one day, one or both of his sons will take over the care and custodianship of his trees. His youngest, Matthew, seems to be the one to make a start. 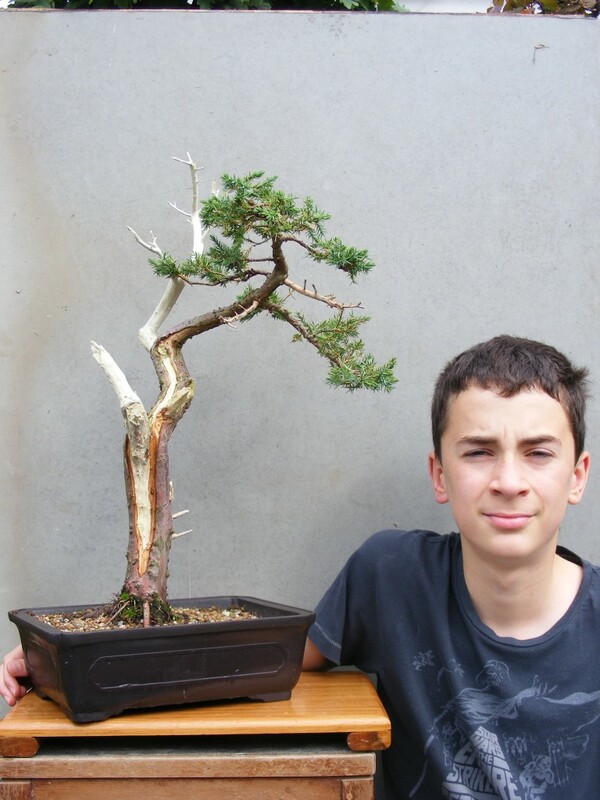 This is Matthew below with his San Jose Juniper after winning the novice section at a local flower show. Ian still has that Chinese Elm he bought back in 1993. 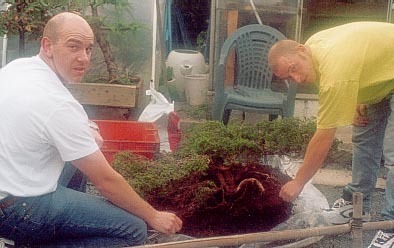 It’s how most people become aware of bonsai and it’s good to look at it and remember how this all started. 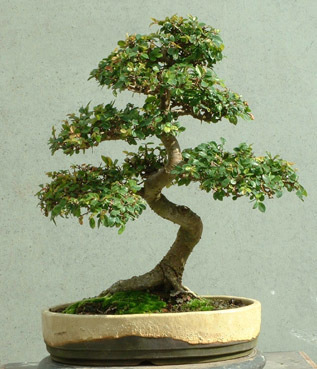 If you would like to see bonsai from Ian’s collection, just click on the Chinese Elm below to visit the gallery page. the photos of you do not really show great aging !! 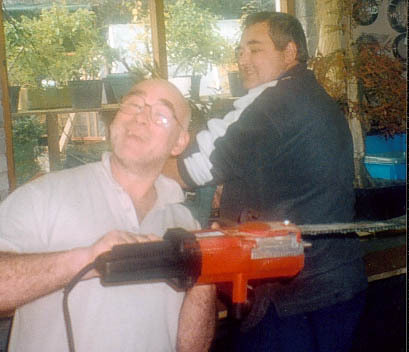 and anyway compared with the pic of that weird guy with the chainsaw your images are quite flattering !!!!! !